welder extraordinaire—at www.metalshapingblog.com. Just enter Dan Webb in the search bar. cage and one of the first tested in a wind tunnel, which led to its curved airfoil shape. The result was an unintentional blueprint that influenced the Art Deco movement in the decades that followed. Beneath its bubble-shaped bronze exterior lay evidence of a compulsive designer fixated on detail and craftsmanship. Harry Miller meticulously constructed that car and his other cars well beyond most practical consideration. Sheetmetal parts, unseen deep within the car’s chassis, were formed and finished to the same painstaking standards as the rest of the visible components. 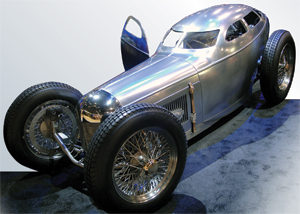 In 2007, Dan Webb set out to honor Miller’s iconic creation by building a low-sloping hotrod variation of the original. For Webb, the project needed to transcend mere steel and rubber and embrace the spirit of Miller’s obsession with quality. What Webb brought to the project 90 years later was a new level of welding technology available only in the last few years. A GTAW machine with too narrow an amperage range can limit the variety of materials that can be welded. A machine with a range of 5 to 230 A provides the flexibility needed to weld on thin materials like 24-gauge stainless as well as aluminum alloys to ¼ to 3⁄16 in. Aluminum requires higher amperages compared to steels, so purchasing a welding machine that cannot reach at least 200 A will limit the maximum thickness of aluminum to 3⁄16 in. The wider the range, the more applications you can perform without having multiple machines. Select a power supply that offers good arc stability at below 10 A. This provides easier arc starts and better arc control, critical when welding on thin materials, as well as optimum crater-fill capability at the end of each weld. Beware of machines that only will produce hot starts, which can cause workpiece burnthrough. To weld a variety of materials—ferrous and nonferrous including aluminum alloys—select a welding machine that offers AC and DC power. AC finds use on self-oxidizing soft alloys like aluminum and magnesium, while DC gets the call for welding carbon and stainless steels and deoxidized copper. Heat control represents a critical success factor for successful GTAW, to minimize workpiece distortion. One to control heat input into the weld without sacrificing weld penetration is to pulse weld—the machine alternates between a higher peak current and a lower background current. This maintains the arc while allowing the weld joint to cool. Many GTAW machines include a number of features that will optimize durability and lifespan. These include environmentally coated PC boards and double-dip varnished transformer windings. process choice at the time. But many builders, including Harry Miller, were unconvinced that welding technology could afford the intricate craftsmanship required for thin-gauge steel. So, many racecars at the time, including the Golden Submarine, were riveted together. Today, most high-end racing and show cars are gas-tungsten-arc (GTA) welded. Webb GTA welds every part of his show cars, relying on the precise control of arc starts, power settings and arc stability afforded by state-of-the-arc power supplies. Most recently, for his shop in Burton, MI, he’s opted for a Lincoln Electric model, the Invertec V310-T AC/DC, which provides a number of variable settings as well as digital display of the effects of each welding parameter. Webb considered the V310’s technology capabilities to be a substantial breakthrough, and so with the original builder in mind, he decided to lay down perfect GTA-weld beads throughout his Golden Submarine replica, regardless of the need for visibility—just as Harry Miller would have done. Attention to detail? Webb deposited welds on similar parts at exactly the same length; identical welds repeated on opposite sides of the car have the same number of ripples; and each ripple is spaced equally apart. On brackets, for instance, with two parallel welds, identical stacked-dime patterns are laid down on the first side and then back up the second side, creating mirror images of each other. To ensure similar weld sizes throughout, Webb used a center punch to mark the base metal at weld start and end points. He then counted the number of times he dabbed the consumable weld rod into the molten puddle, precisely timing intervals and travel speeds. His ultimate goal was for weld continuity throughout the entire car. The digital display on the Invertec power supply helped Webb achieve such a strict level of control. As needed, he could scroll through preset welding parameters and dial in weld-current settings for each application. He also controlled AC frequency and balance by monitoring the digital display to see how the arc reacted to different parameters between welds. Webb put more than 3000 hr. of metal shaping into his Golden Sub replica. He says that the meticulous quality rested on his ability to be aware of the weld current and heat going into each weld. The original Golden Sub’s notable golden hue came from a combination of lacquer and bronze dust. Webb’s modern tribute car, on the other hand, features a hand-formed, unpainted raw-steel body that purposely exposes the builder’s workmanship. Webb says he will never paint the car. Steering, shifting and pedal controls on Webb’s car are all hand-formed in steel. It sports a 2.0- l Ford Zetec four-cylinder engine with mounted disc brakes borrowed from a motorcycle. The torque tube passes between the driver’s legs, and the exhaust is channeled through wrapped pipes down the drive’s left side, exiting through the rear tail tip of the teardrop body. In its day, the original Golden Submarine embodied a never-before-seen blend of form and function that won 20 major races and qualified for the Indianapolis 500 before its engine died, along with its chances to race on. It cost $15,000 to construct, entirely by hand, but was later lost in a fire in Joliet, IL. After a car show last year, when Webb first displayed his replica, the nephew of Golden Submarine driver Barney Oldfield sent a letter to Webb writing that he thought his father would be proud of the reproduction.